However, I had no idea what 'subject' means, upon research, it seems to be that which is the reason for existence of a sentence i.e a noun for e.g 'sky' in the 'sky is blue', the subject at hand is sky, to which it is blue. Anyway, I could be wrong, and even if not I still don't know what the subject of a sentence of a proposition is or means. I always thought a proposition was a sentence only one with assertion i.e one that is true or false. So all propositions are sentences but not all sentences are propositions. So this just adds to the confusion. Furthermore, I can't draw up a connection between predicate, and what it means to be predicated. I think a predicate is a proposition with variables, so for e.g instead of 'the sky is blue', you could have 'the n is v' where n = noun, and v = verb. From this, I suppose to be predicated could mean to be variableized? Though am not at all sure. On a side note, perhaps the term is just archaic? A common structure of sentences is that of subject-predicate. The subject is what the sentence is about, and the predicate is what is said about it. Usually the subject signifies an object and the predicate signifies a property. To predicate a property of a subject is just to substitute a subject for the variable in the open sentence that represents that property. For example, to predicate the property of being blue is just to fill in the blank in '___ is blue'. In this case the property of being blue is predicated of something. 1 'is a predicate' is also a predicate. that which is affirmed or denied of a subject in a categorical proposition. one which makes an absolute statement about its subject. the ultimate logical classification of all genera, species, and finite individuals. 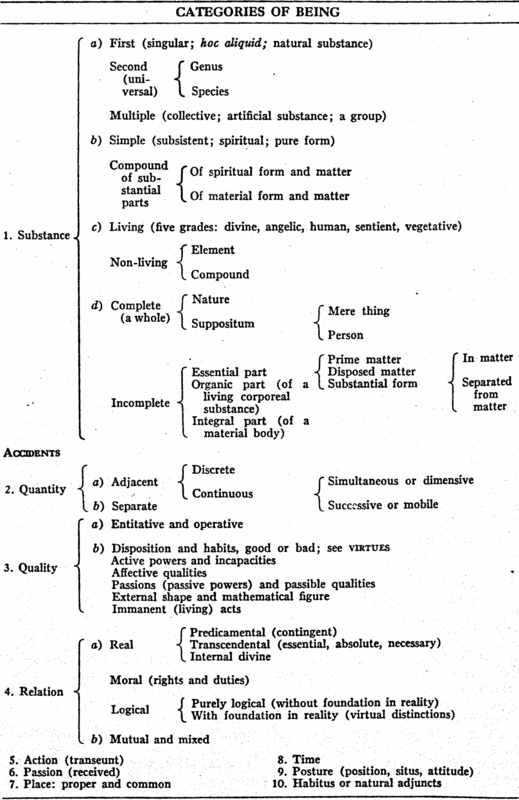 Aristotle outlined his ten categories in his Categories. Here's an example logical classification (ibid., p. 18): These things can be predicated of any changeable being (ens mobile). One can distinguish subject and predicate by looking at the extension of the terms. Subjects are of greater extension than that which is predicated of them. "[All] red [things]" is "ball." This would imply the only red things are balls. This is because "[all] red [things]" has greater extension than "ball." Ch. II of vol. 1 of Coffey's The Science of Logic is on the predicables. Historian of medieval logic Terence Parsons calls, in Articulating Medieval Logic, the OFL by Poinsot "a very competent work from the early 1600s"
If a property-bearer (anything that can be referred to, even in a Meinongian semantic ontology, has a respectively unique set of nuclear properties) bears certain property(s), then that predicate (the property it bears) obtains of, or is predicated of, the subject (the property-bearer, or thing that bears or has the property). If the sky can bear/have properties, and blue is one such property it could have, and it does have said property, then the sky bears the property blue, typically expressed in a sentence of the form 'X [copula] F,' or 'Sky is blue.' Remember Russell's analysis of the copula (is/are), with the copula typically referring to some condition obtaining of an object, or being something had or attached into the ontological nature or existence-criteria of the individual object, as meaning either (1) composition or makeup (the floor is lava! ), (2) quality or feature (the rock is brown), or (3) relation (he is late for work). Not the answer you're looking for? Browse other questions tagged terminology aristotle definitions or ask your own question. How many predicables does Aristotle have? What does *substantive* in the term 'substantive normative claim' mean? What does immaterial mean for Aristotle? What does Aristotle mean by showing fear in times of boldness? What did Aristotle mean about the Pythagoreans? What does “it” refer to in this short Aristotle passage?